People (men especially ?) like crashes. It's a fact. Not the morbid side with dead bodies and all, noooo ! they like to see cars out of control, bumping and rolling, they like to see metal crashing and glass breaking loudly with no one injured. It's like explosions in movies, it's impressive and thrilling. But it's difficult to offer that sensation properly and safely. What else, but a video game, could achieve it ? Burnout 2: Point of Impact is not your serious (and boring) four wheels simulation which rejoices some looney who got all excited when they can "drive" the cars they fancy in magazines or improve by 0.01 second the fastest lap time. This is hardly a game. No, Burnout 2 is about speed, quick reflexes and crashes. You don't know how to drive ? Perfect, at least you won't bother everyone telling it's not how it works in reality. Burnout 2 is a game back to the roots of gaming, from which idiotic games like Gran Turismo had taken us away. You drive for the sensation of speed, for the pleasure to go berserk in town area among other cars and, above all, for the intense dougle-edged pleasure of crashing. Crashing is exciting as such, to see how beautifully you can destroy your car and the others' or send it flying, it's also exciting as a danger: the fear of crashing hard and losing time during an important race is much more motivating than just losing speed or being overtaken by a better driver. And it's less irritating too. Criterion has worked well to improve from the first game. 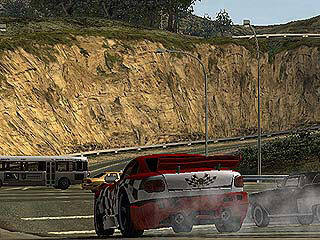 Many critics concerned the gameplay, it's good to see they optimized it to make Burnout a smoother and better experience. Crashes are well integrated in the course of action, almost perfectly. One inconvenient is the view of the crashes, it's based on time so if your crash is a bit too long or too slow, it's interrupted. It's a pity because sometimes you'd like to see more of it. You won't have a chance to watch longer during the replay either, the time restriction is still active and you don't have any camera or time control like pause. 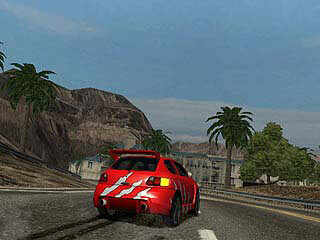 However, Burnout 2's replay mode is fantastic. Usually, I get bored watching the replay, in Burnout, you almost have as much pleasure playing as you have watching your race. Simply because the driving is so thrilling, so fast and furious, and, as a matter of fact, so movie-like, that it's really enjoyable to see your car zigzaging in the traffic or suddenly crashing into a truck. Crashes being the main asset of this game in regard to the competition, there is a mode just for it where you will need to score high (meaning to make a lot of dollars of damages) and get some medals through 30 challenges. It's not difficult to get a bronze medal, a bit harder to get the gold one, but it's all about crashing fun. All in one a fun mode, second best after the normal racing modes. A simple race is indeed the best way to enjoy Burnout 2 fully. Controls are very good and simple, skidding as well, just brake a little while you turn, and here you go. By pressing L, you can also hoot or use the emergency lights if you're driving the police car. 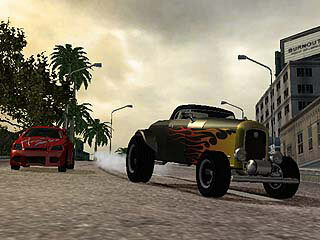 There's a fair number of cars in Burnout, more than 20, unfortunately, they tend to lack identity. It's not a problem that they didn't use real brands, it's just that these cars look a bit like toys and most of them are very similar. Their name is nothing more than their type: Coupe, Pickup, Roadster, etc. and, among the unlockable: Hot Rod, Gangster, Classic, etc. plus some fancy versions of the primary cars. Car selection is definitely not the most thrilling aspect of Burnout 2. And what about the tracks ? There aren't as many as it first seems, but they span on several kilometers/miles at least. Among all tracks 5 are just a larger version of another one, meaning you have to race through new areas of the same track; some others take portions of existing tracks, for instance in the highways. You could almost link all these places in one giant track. In addition, you have to play all of them mirrored. It doesn't take long to feel you know all the major circuits, there are about 6 or 8. Quite long and well done visually, they are also a bit tasteless. Once again, they lack identity, charisma, personality, whatever you call it. Lots of anonymous buildings, and roads, and tunnels, and trees give finally little life to the game. There are very many things to see and everything is detailed, enough to feel in an extremely realistic environnement when driving, but it also feels dull. Maybe because there's no people except the ones supposed to drive the cars or maybe because it's so realistic that it's cold like a real urban landscape. It might be also because you can't go out of bounds and when you somewhat manage, the graphics look much less detailed all the sudden (water, ravines, trees, buildings...). It might not disturb everyone, but after a while, you might somehow feel less satisfied with the graphics than you first were. One little disappointement comes from the sound. All the crash sounds are terrific, very loud and realistic, but the engines are not that good. They don't roar enough, they caught a cold or they are just asthmatic, who knows, it's not exciting anyway. Some cars really seem to buzz rather than to growl. And for the musics, they are a bit boring, sooner or later, you'll end up turning them off. Like this you can fully enjoy the noisy police car for instance. 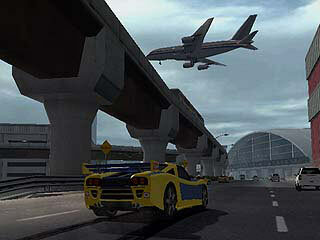 In pursuit mode, you drive a police car in a chase to catch a runaway car. You win once you took all of its life point which goes away when you touch it. You can play this mode, along with single race and crash, in multiplayer. However, as soon as the screen is split, the visual quality seriously diminishes. Such a shame knowing the GameCube could perfectly handle this situation if well programmed. Burnout 2 is a well balanced game. The first races are quite easy while the custom races are tough. The only way to get the locked car of a grand prix is to get gold medal in each race, that's sometimes really hard. Actually, the Point of Impact grand prix is too difficult compared to the previous races: rival cars go really fast and follow each other closely without crashing very often. Once the leader is far away, it's impossible to catch up, he will not make mistakes anymore. In addition, it's all tough mirror tracks with impredictable traffic. This also brings to light a drawback of Burnout 2's fascinating crashes: when the game gets harder, they become a real pain. It's quite impossible to avoid them and their effect is fatal to the issue of the race. Both the final grand prix and some unlockable cars might give frustration. 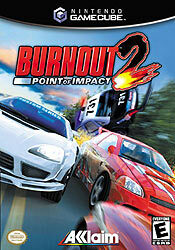 It's no doubt in mind that we can say Burnout 2: Point of Impact is an excellent game and the best racer on GameCube. It was difficult to choose between 8 or 9 for a final score. It would deserve "only" 8 for its disappointing music and engine sound, for some repetitive tracks and some boring cars, for its loading times and the roughness of the visuals in multiplayer mode, for its lack of style from the menus to the graphics which make it look too cold, and for a few other things. Yet, it does deserve 9 for the exceptional quality of the crashes, which are very impressive, with astounding dynamics and will take several "wow" out of your mouth. It deserves also 9 for its rich graphics environnements, great sense of speed, lenghty tracks, fascinating replays, numerous modes, easy controls, good difficulty, automatic saving and the general stats. There's definitely room for improvement for a Burnout 3, in the meanwhile, there's a lot to enjoy in Burnout 2. 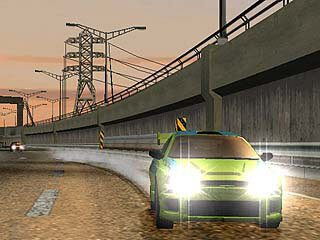 Compared to other racers, on any systems, it is still a high profile game. The crashes make all the difference, try it and you'll understand. "Burnout 2: Point of Impact is the follow-up to the original smash hit with improved graphics, faster gameplay, and bigger, more spectacular crashes. Nintendo GameCube fans can leave their sanity at the starting grid and prepare for the white-knuckle ride of their life. The GameCube version of Burnout 2 boasts major improvements and is all set to take pole position as the best driving game on the console, taking the genre to a new level, with stunning graphics, white-knuckle foot-to-the-floor gameplay and improved crash-scene carnage! - Offensive Driving 101, where you can "Learn to Burn" from the Burnout Driving School. 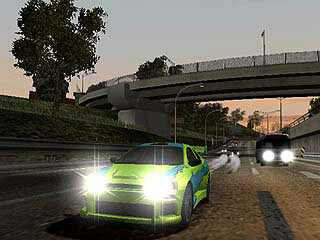 - All-new Pursuit races allow players to race a police car and ram opponents off the road. - Crashes are bigger, badder, and more heart-stopping than any seen before: Vehicles deform and car parts fly across the highway. - Gamecube version includes 15 more crash junctions than PlayStation 2 version. This mode is now twice the size as the PS2 game mode. - Advanced lighting effects such as Bloom Lighting: highlights reflect off of windshields and metal exactly as in real-life. 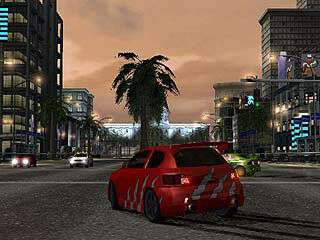 - New Custom Series Mode that allows you to race modified vehicles complete with body kits and decals. - Progressive scan and Dolby Pro-Logic II support. - Six new United States locations, including Miami, Los Angeles, The Rocky Mountains, New Mexico and a busy international airport. - Seven secret vehicles to unlock including police cars, 1950's hotrods and stock cars. 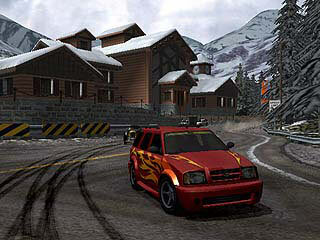 - Realistic weather effects, such as snow, rain and fog. - All-new points-based championship gameplay structure. 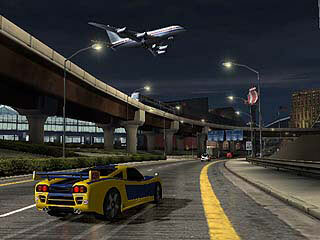 - Vehicles can get air and earn boosts by jumping. - Intelligent traffic system, featuring three distinct types of driver behaviors. - Significant increases in polygon count and texture size. - True specular reflections with specular mapping. - True specular lighting with specular mapping on all surfaces. 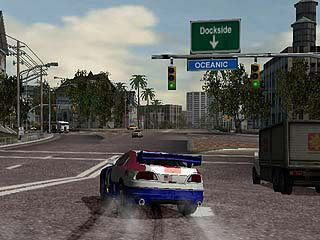 - Dynamic weather effects including rain and snow. - Anti-aliasing and flicker filtering. - Progressive scan TV support for NTSC version. - Dolby ProLogic II support. - Specular bloom effects for ultra-realistic specular lighting and halos. - More "Hollywood" style crashes. - Enhanced traffic system supporting complex intelligent behaviors. - State-of-the-art CPU opponent AI with advanced humanistic spatial awareness. - Enhanced engine audio model including real-time distortion processing. - Dynamically mixed context-sensitive audio streaming. - Non-interrupt-driven texture upload system for higher performance."